This is my go-to recipe for an unplanned weeknight meal. It’s super easy—in just four steps you get a family-friendly and company-worthy chicken dinner in minutes. To get extra mileage out of my chicken breast dollar, I like to slice a thick breast into two or three thinner cutlets. I find that three chicken breasts wisely prepped is plenty for serving a family of four. 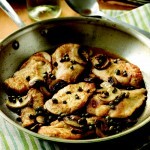 Plus, thin pieces of chicken cook more quickly than thicker ones, meaning dinner gets on the table that much faster. I love the bright citrus flavor and tanginess of the lemons and capers in piccata, but feel free to adjust the ingredients as you like. Tip: Cutting chicken breasts into cutlets is easiest when the chicken is slightly frozen. Step 1: Dredge and brown the chicken. Place a chicken breast on a cutting board and set your palm on top of it. Use a sharp knife to slice the chicken into 2 or 3 cutlets. Repeat with the other 2 breasts. Blot dry with paper towels and season with the salt and pepper. Place the flour in a shallow dish and dredge the chicken through it, evenly coating the chicken on both sides. Place on a plate and set aside. Heat the olive oil in a large skillet over medium-high heat. Set the chicken in the pan and cook on each side until browned, 6 to 8 minutes total. Transfer the chicken to a platter. Step 2: Sauté the aromatics. Add the mushrooms to the pan and cook, stirring often, until they are browned, about 5 minutes. Step 3: Deglaze the pan. Pour the wine and lemon juice into the pan, using a wooden spoon to stir and scrape up any browned bits from the pan bottom. Step 4: Finish the sauce. Add the capers and then stir in the butter until it is melted and the sauce comes together. Turn off the heat and pour over the chicken before serving. Reprinted from the book Ten Dollar Dinners. Copyright © 2012 by Melissa d’Arabian. Published by Clarkson Potter, a division of Random House, Inc.